For any house owner carpet cleaning is a very serious business that can never be neglected. The problem becomes even more acute when you have to remove stains from your carpet. As more and more people are becoming environmentally conscious, carpet cleaning products with negligible or no chemical toxins are becoming very popular. All of the green carpet cleaning products used to remove stains, white vinegar is considered as the superhero of stain removers for carpets. Foaming rug carpet stain cleaner is also popular among professional cleaning companies. Plain white vinegar is a remarkable natural cleanser and is also the most versatile all purpose cleaner found in your home. White vinegar is a natural deodorizing agent that not only removes stubborn carpets stains from food, pets and liquid spills but also freshens your carpet. · Has the ability to kill moulds. While white vinegar is an extremely effective carpet stain remover, it can be dumped on the carpet like a industrial cleaner. With vinegar there is a risk that you may end up damaging your carpet if it not applied skilfully. Like any other stain remover it essential to test vinegar on a hidden area of floor before actually applying it on the carpet. With the help of a damp cloth an inconspicuous area of the floor can be soaked before using vinegar. This should be done as if you were actually cleaning the area. After twenty-four hours, if there is no change in the colour and texture of the carpet you know that it is safe to use. It is always best to dilute vinegar with water to protect the fibres of your carpet. To get maximum results you will have the soak the vinegar water solution of the affected for a while. During this period the room will smell of vinegar but the odour will disappear as soon as the solution has dried. There is no need to rinse the affected area. White vinegar is useful is eliminating fresh stain from food, drink spills, accidental pet stains or dirt and grime from outside. 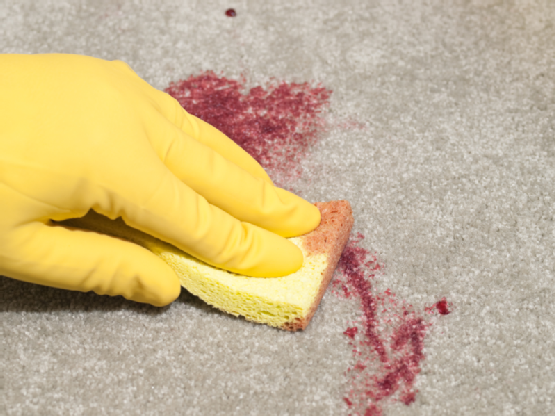 It is more prudent to treat the stain as soon as it happens rather than waiting for it to settle on the carpet’s fabric. Any solid matter from a spill should be first scooped up. Similarly, any liquid spill should be wiped clean with a damp towel or absorbent cloth. Once this has been done diluted vinegar can be sprayed on the affected area and allowed to settle. Then it should be wiped dry with a clean towel until the stains are no longer visible. While vinegar is an extremely effective carpet cleaner and stain removing agent, it will always be prudent to dilute with water. This is done to protect the fabric of your carpet and its texture. If you have difficult stains, call in the experts! Before reading this I had never thought about Stain Remover.It gives me a lot of information. Kinds of Brushes Used for Carpet Cleaning! How to clean your upholstery in few steps! Myths about tile and grout cleaning dispelled! Give your floor a makeover!